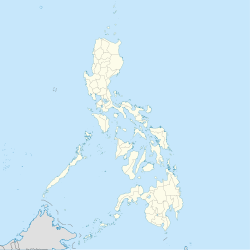 Manjuyod, officially the Municipality of Manjuyod, is a 2nd class municipality in the province of Negros Oriental, Philippines. According to the 2015 census, it has a population of 42,332 people. Manjuyod is politically subdivided into 27 barangays. The town is known for the Manjuyod White Sandbar, often dubbed as the "Maldives of the Philippines"
Tourist attractions in Manjuyod include the Himampangon Cave, a natural rock formation; the white sand bar, a narrow seven kilometer strip of white beach sand; and the Candabong forest, there are many species living in Candabong forest which is protected by the government. Saint Francis of Assisi is the patron saint of Manjuyod, and his feast day is celebrated annually October 4 with the town fiesta. The fiesta is an official non-working holiday for the town. This page was last edited on 12 April 2019, at 01:27 (UTC).